The mighty falleth, and riseth anew, so that we may see them fall once again. I’ve busted through this 47.7% barrier three times. 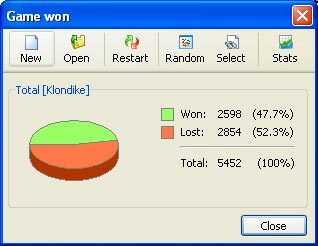 Klondike isn’t just a great way to pass the time away. 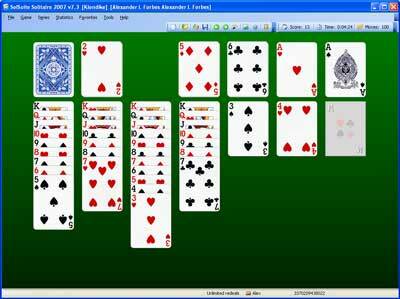 It’s a tough Solitaire variant requiring more concentration than you might suppose. If you play it long enough, you’ll see that even one oversight or mistake can make the difference between win or loss. To get this measly one percent gain in the stats took a lot of work. I’m doing at least one thing different, by which I can account for the gain. I’m spending a lot more time interrupting myself, so to speak, to work the “tableaus” (7 piles on the bottom) – the cards I’ve already played. For example, say I need a five of clubs on the foundations (4 piles on top). I have it, but it’s buried by a red 4 of hearts and a black 3 of spades. I do have a five of spades I can get to, on the bottom of another foundation. What to do? Simple, move the 4 of hearts (and the 3 on top of it) over on top of the five of spades. It’s worth the extra effort. Now I can move the five of clubs to the clubs foundation pile. It’s only one card. But sometimes it pays to get “greedy” while you can — if I waited, the five of clubs might get buried too, and then it may be too late. Doing this is also a double whammy. Not only do you build your foundations, you get to turn over the next card buried in the tableaus and play that too. At a minimum, you’ve parlayed this into two good plays. With a little luck near the end of the game, this can cascade into a win that otherwise would have been a loss. And we knew there was a specific reason for mentioning this little strategy. See the image below. This game isn’t even finished, but you can see it’s a guaranteed win: the tableaus are now all played out. All we have to do is move those cards up top to complete the foundations (or click “Game/Autoplay” from the menu, which takes the repetitious grunt work out of it. This looked like a loss, but what I did is remove my six of diamonds (yes, the image is hard to read) back off the diamonds foundation, and put it down over my seven of spades. This allowed me to play my five of spades from one of the stagnant tableaus. Before I saw this move, I thought I was stuck with a loss. But, true to my earlier real-time prediction, this little stunt cascaded into a win situation. Was it a win? Of course it was a win. When the big picture seems too cut-and-dried, it’s time to start sweating the small stuff.